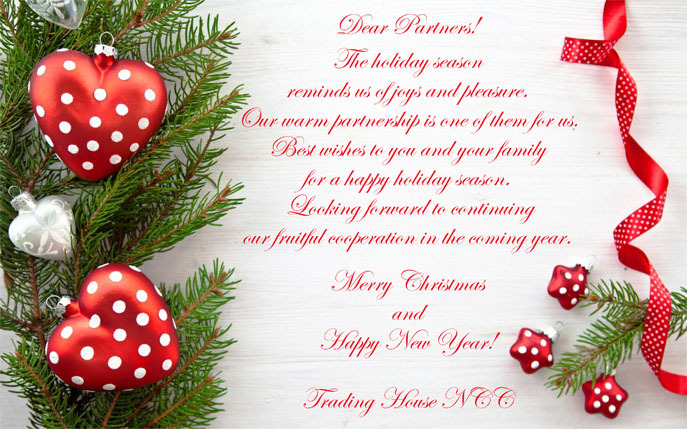 Trading House NCC has been developing and promoting its own brands on the market of household goods since 1998. Trade activities of Trading House NCC cover the territory of The Russian Federation and a number of CIS countries. Products of Trading House NCC are available in all kinds of sales points: in federal and local chains, retail shops and markets. 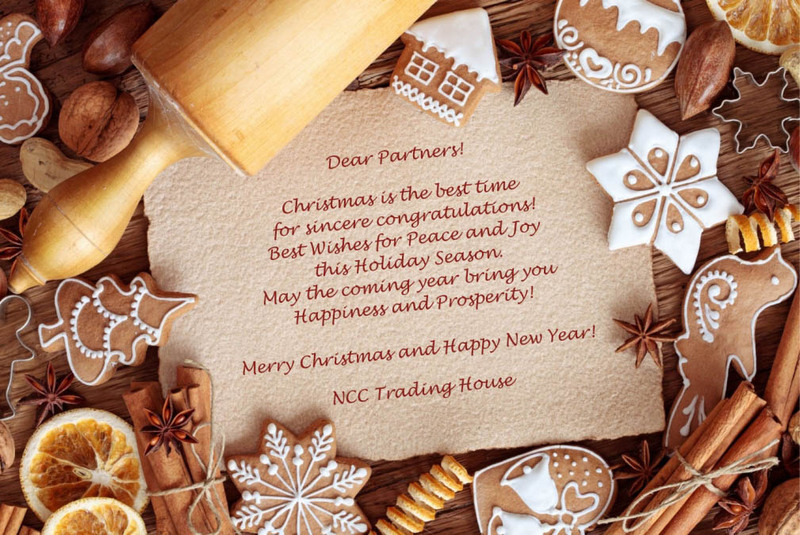 Trading House NCC creates trademarks, which become popular and favorite among Russian consumers. 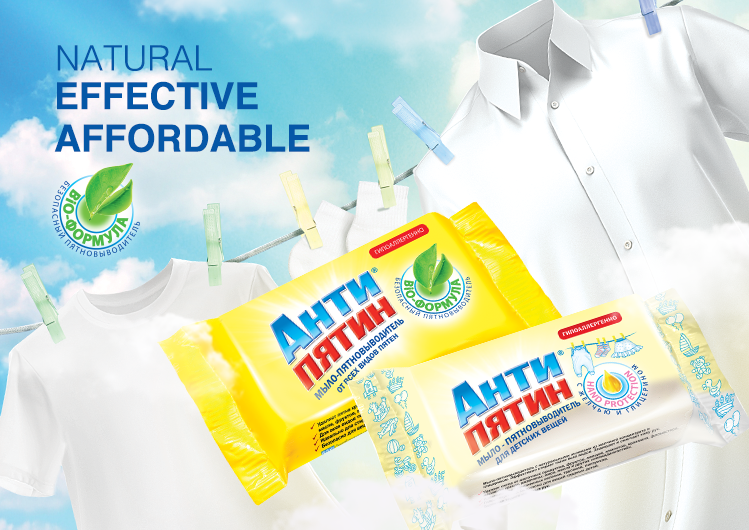 The most famous products are stain removers ANTIPYATIN® and household goods CHISTYULYA®. Our products can be found almost in every house. The product range is wide: household sponges, household cloths, dust cloths, cleaning cloths for floor, microfiber cleaning cloths, mops, household gloves, garbage bags, aluminum foil in roll and many others. 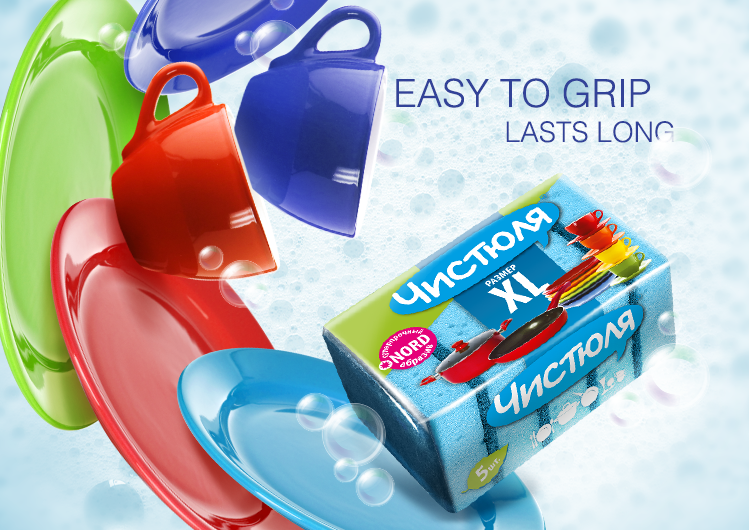 We constantly expand our product range introducing completely new goods for cleaning. Our household goods are successfully learning to do the cleaning themselves. Consequently, housekeepers can devote more time to their families. For example, microfiber cleaning cloth draws dirt to itself and PVA mop wrings itself out almost on its own. 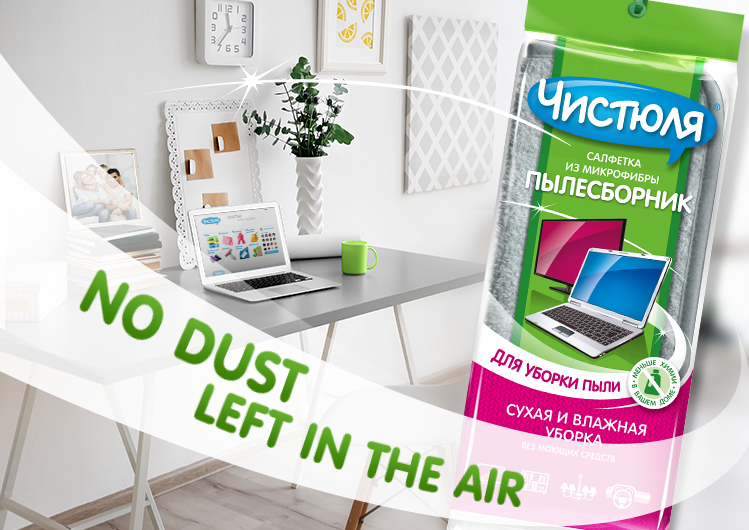 More and more housekeepers get to know that modern and reasonably priced household goods of Trading House NCC (IKEEP!®, DONNA ROSA®, CHISTYULYA®, DOMINGO®, ANTIPYATIN®, ANTIZASOR®) can help to keep house clean with a minimum of effort and with pleasure. National Chemical Company was founded in 1997. Creation of the first trademark ANTIPYATIN® (soap for stain removing). Trading House NCC was founded in 1998. Construction of production facility for household sponges manufacturing. 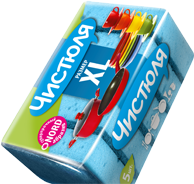 The manufacture of dishwashing sponges and bath sponges was launched. A unique for Russian market technology of flame lamination was worked out. The technology makes it possible to bond foam to abrasive (fiber) without glue. Introduction of a new product group – cleaning cloths for floor. Introduction of new product groups - viscose and cellulose household cloths. Production of polythene film started. The Company entered the market of garbage bags. The construction of manufacturing complex of 15,000 m² in Sosnovyi Bor is completed. 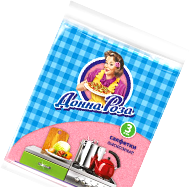 The Company is a leader in manufacturing products for cleaning made of foam, abrasive, viscose and cellulose on the Russian market Non food FMCG. 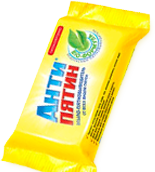 ANTIPYATIN® soap is a brand and a corporate identity. The products are distributed through wholesalers in the entire territory of Russia. Brand building, release of household goods under various trademarks. The growth of competence of some key departments. Quality distribution in the territory of The Russian Federation and CIS countries. Coverage of the networks of the A and B categories. The optimal assortment matrix has been developed. The Company constantly develops its product range. The professional team of specialists is created. The Company entered the market of water pipe cleaners with ANTIZASOR® trademark. 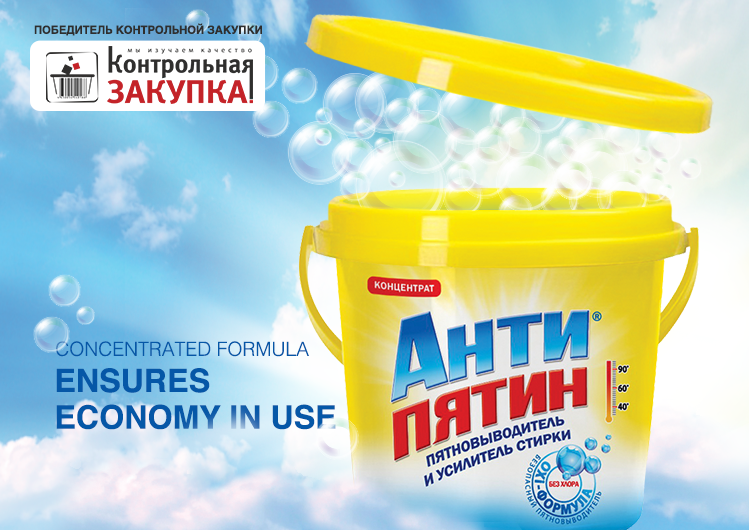 The company entered the emerging market of safe and non-toxic household detergents. Creation of DONNA ROSA® trademark. 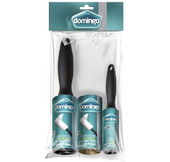 Rebranding and renewal of DOMINGO® assortment. Target audience of the trademark has grown, and the trademark is changing along with it. Team: more than 100 employees. The organisational structure of the Company consists of 10 departments. The balanced assortment matrix was created. Company’s trademarks are popular on the market, and well-known among consumers. Creation of the destination representatives system in the Russian Federation and the Republic of Belarus. Creation of the distribution system in the Russian Federation and CIS countries. Implementation of the efficient logistics system. The company has its own manufacturing complex situated in Sosnovyi Bor, Leningrad region. The manufacturing complex consists of warehouses and office premises of 35,000 m². We see people’s need for cleanliness and comfort as their pursuit of new quality of life. Home is our universe, which we create and design. It is a micro world, the only place where one can create environment at his own wish. Household management is the model you manage your life. Setting up house, we are learning to plan. Arranging home improvement and cleaning, we are preparing for project management. Moving furniture and putting things to rights, we become aware of the great power of the system and optimization. That is why it is so important not to turn housework into hard duty. Our minimum aim is to saturate the market with technological novelties of high quality, which can solve many household problems. Our maximum aim is to change the way people feel about housework. We believe that modern tiding up is not a routine job, that it can be easy and pleasant. We would like to convey the idea that well-organized housecleaning can become a way of self-expression and the source of positive emotions. To achieve the goals, we cooperate with innovative manufacturers, and develop affordable household goods, which can help to make cleaning a fast and easy job. You needn’t hide these articles! 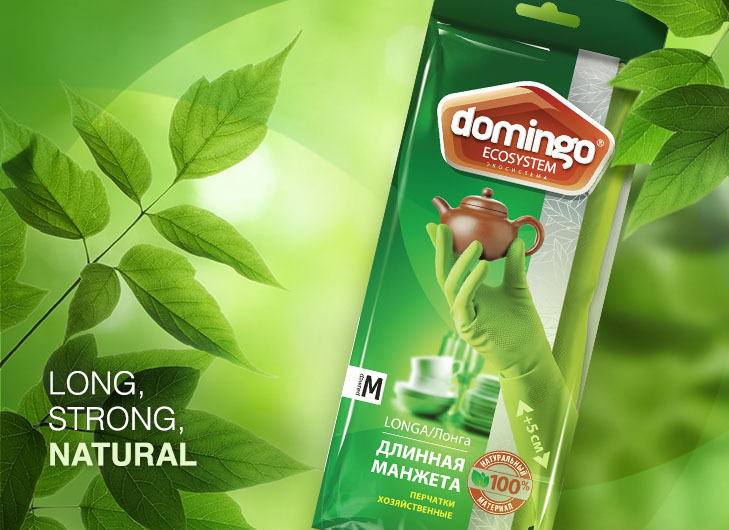 DOMINGO® trademark was created in 2014 as a trademark of professional goods for cleaning. 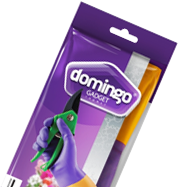 DOMINGO® offers a range of unique goods of premium quality at lower prices. Household goods, goods for cleaning. Comfortable house along with DOMINGO® is a modern house that is changing for the better. It is a beautiful house, where even household articles look attractive, where household duties are light, do not demand much effort and save time. Women, 25-45, who have middle and upper middle income; live in a big city. Home, family, self-improvement (career, hobbies, sports, extreme sports, yoga, dancing). The person is not afraid of experimenting, keeps an eye on market trends, ready to use innovative products. Emotions have an impact on purchasing decisions. A purchase can be spontaneous. Beauty and style everywhere, even in household goods that are hidden from seeing. Forestalling /formation of market trends. The development of the product range is based on wide functional and esthetics. Filling the product range only with the most popular SKU in each category, but with unique characteristics for each product. There is a great number of unique items in the assortment. 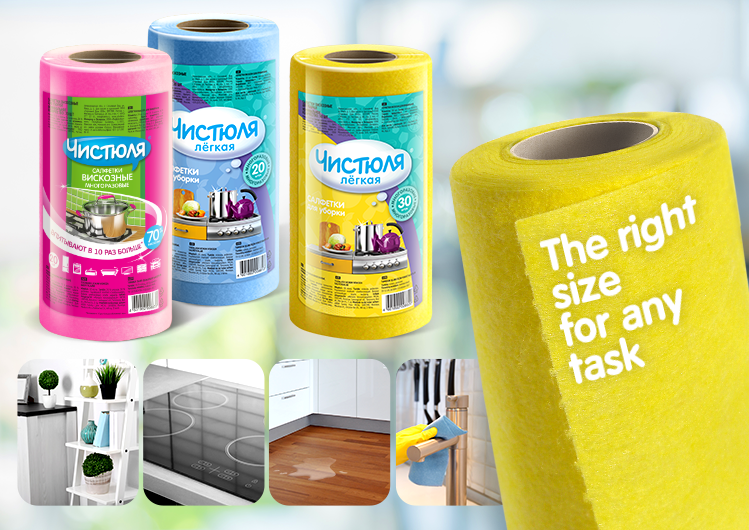 CHISTULYA® trademark is a leader in the mass-market segment on the Russian market of household goods. Loyal audience of the trademark is constantly growing. The products under this trademark are sold in the entire territory of Russia and in a number of SIC countries. CHISTULYA® is designed for those who prefer reliable, quality goods at a reasonable price. «Чистюля» helps to spend on housecleaning a sensible minimum of effort, time and money. Women, 25-55, who have families, their income is middle or lower middle; make purchasing decisions themselves. Keeping the house clean and tidy without spending much free time. Rational, tendency to choose familiar goods of high quality. Products of good quality at a reasonable price. The most popular among mass buyers products. Donna Rosa® – the most necessary household goods of traditional quality. Donna Rosa® advises to take domestic chores lightly and suggests treating domestic chores as a game. At home you are a donna. Feel “a bit Italian” in your kitchen: easygoing, playful, jolly and full of energy. Women, 25-55, who have families; their income is lower middle; make purchasing decisions themselves. Products at a low price, that are familiar and of good quality; recommended products. Hypermarkets, supermarkets, hardware shops, kiosks, open markets. Minimum of product items, only the most popular among mass buyers products. IKEEP! (from English «I keep»). It means self-concern, care for family and for the Earth. Safe and non-toxic household goods. 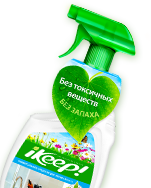 For safe and easy cleaning a product line of ecological detergents IKEEP!® was created. Creating detergents, we have primarily focused on those who look after themselves, take care of their families and environment. Our cleaning products do not contain chlorine, phosphate, flavoring agents or toxins. They contain natural ingredients or 100% biodegradable ingredients. Thanks to it, the products are hypoallergenic, safe for children, adults and pets. Effective stain removing without any harm to health makes it possible to use IKEEP! products for daily cleaning. Women, age 20-55, who take care of themselves and their families, health-conscious. They are married or single but family oriented; have middle and upper middle income; make purchasing decisions themselves. Self-improvement, family, health. Appreciate natural and ecological products. Intellectual, rational, however purchasing hygiene products can prefer the products, which are more stylish and interesting. Prefer high-quality and healthy products that are functional and made of natural ingredients. Stylish design, easy to understand product advantages, reasonable price are also very important. Novelties are attractive only if they are not too expensive. Hypermarkets, supermarkets, hardware shops, neighborhood shops, chemist's shops. The most popular products among mass buyers. Innovative products are primarily more successful and attract interest of the growing market of eco-friendly goods. Having created the soap under trademark ANTIPYATIN® in 1997, Trading House NCC entered a niche segment of the household chemicals market. At present, ANTIPYATIN® is a brand and a corporate identity. The products of this trademark are popular both in Russia and CIS countries. 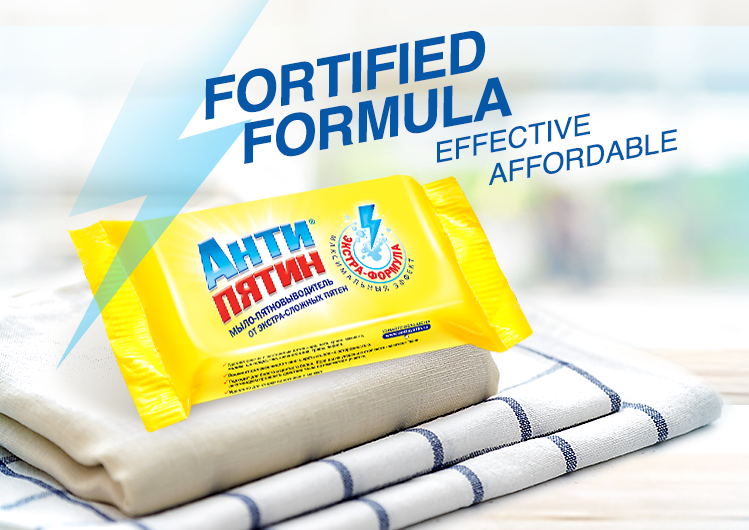 “Wherever you face the problem of stains – at work, when you put a stain during lunch, at home, when you see the multicoloured spots on the shirt of your child or on the sofa, - you can always count on ANTIPYATIN®. Women, age 25-55, who have middle and lower middle income; make purchasing decisions themselves. Stains on clothes and furniture are the main enemy. Perfect effectiveness and safety are the most important criteria for housecleaning. Hardware shops, supermarkets, shops specializing in household chemical goods. 1-2 SKU for various purposes and stains of different origin. The trademark ANTIZASOR® has successfully been developing since spring 2009. At present, the product line has been complemented with a liquid clog remover and concentrated gel. The trademark ANTIZASOR® offers a range of products designed to meet the requirements of different types of consumers and stores of different formats. 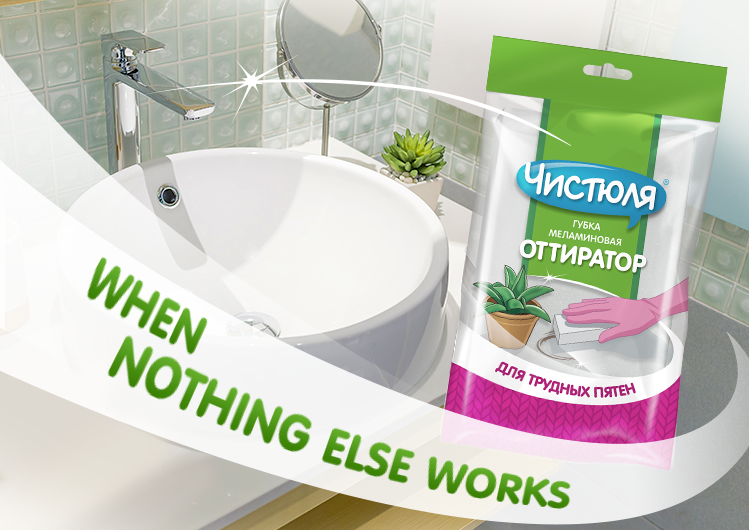 No matter what the reason of clogging in your water pipes is, ANTIZASOR® will help you to solve the problem. Men/Women, age 25-50, who have middle income; make purchasing decisions themselves. Home comfort, absence of any disrepair at home. Rational, tendency to choose domestic goods similar to the goods which multinational brands offer, but at a lower price. Fast and effective cleaning, safe for pipes. The packaging must meet all safe storage requirements. Hypermarkets, supermarkets, specialty store, outlets, outdoor markets. • All products are highly effective and quick acting. • The effectiveness of each product is confirmed by independent test institute Scientific Research Centre of Household Chemicals. Why spring cleaning cannot be easier and more joyful, and maybe more romantic? Find new spring colors of the most popular microfiber cleaning cloth in warehouses and stores. CHISTULYA® for kitchen and bathroom. Soon afterwards, spring mops with microfiber mop refill matching cleaning cloth will appear in stock. Trading House NCC represents a new line of care products for clothing - DOMINGO® STICKER Sticky Rollers for Cleaning Clothes. The Sticky Rollers DOMINGO® STICKER is cleaned quickly and efficiently due to the improved composition of the adhesive layer. Rollers cleaned clothes, upholstery and car interior from any kind of fabric from dust, hair and lint. Contaminated layers easily removed due to the diagonal wound. You just need to pull the corner of a leaf, the leaves are not interconnected. The nozzle is held firmly in a comfortable ergonomic handle video. If necessary, use a block can be easily replaced by a new one. Additional convenience in storage - a protective case. He does not allow the roller to adhere to other subjects, and the sticky surface - clogged. The kit includes a mini-roller travel-format, which is easy to carry. УД011 DOMINGO® STICKER Set: Sticky Roller, Refill Pack, a Mini-Roller. The main value of the Company is the people, the team of professionals who love their work. We are ready to work so that the best ones will get to know about us, appreciate our ideas and join our team. Metro station "Tekstilshchiki", the last carriage from the center, then two stops by bus or trolleybus of the following routes. Bus routes: 54, 228, 350, 623, 633, 650, Вч. down to Lyublinskaya str. up to Chistova str. 350 m to Chistova str.